I recognized the look Newsome portrays; I've seen it floating as a dim reflection in the window panes through which I watched nothing going on along Business Loop 70 so many nights. 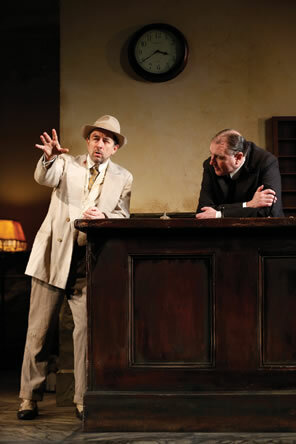 Richard Schiff as Erie Smith and Randall Newsome as Night Clerk in the Shakespeare Theatre Company's production of Hughie, directed by Doug Hughes. Photo by Carol Rosegg, Shakespeare Theatre Company. I worked as a night clerk at the Stephens Holiday Motel for three of my four college years, 11 p.m. to 6 a.m., three nights a week, including Friday nights to Saturday mornings. I suffered a couple of postmidnight hours with an "Erie" Smith, the drunk hustler played by Richard Schiff in Shakespeare Theatre Company's gripping production of Eugene O'Neill's one-act play Hughie. My empathy, therefore, is with Charlie Hughes, the night clerk played with exquisite subtlety by Randall Newsome, sitting behind the counter, staring at nothing through the rut of his nonessential life. Though Hughes has been a night clerk in New York so long "he can tell time by sounds in the street," according to the stage directions, he is new to this downtrodden hotel when Erie ambles in, coming off a five-day drinking binge. Erie is identified in the program's cast list as "a teller of tales." He resides in room 492 and, for the hour the play passes, he regales Charlie with his exploits as a gambler, the big shots he pals around with, and the dames he beds two and three at a time. All of his stories, though, come back to Hughie, the hotel's previous night clerk, also named Hughes, who had recently died. Erie claims to have taken Hughie under his wing and granted him a window through which the night clerk, married with two kids, could escape from his mundane existence into Erie's glamorous life. The parallels to my experience with that of Charlie go beyond the alcoholism hovering around the customer like ice fog—an environment that hit my nostrils the moment my "Erie" pushed open the door to the motel's office. He was considerably older than the 45 Erie on stage claims to be. He wanted a room, but he only had a check, which I couldn't accept. He then regaled me with how he was a good friend of the motel's owner, Mrs. Stephens, the good times they had had, and how he himself had built the motel. The Stephens Holiday Motel was one of three Stephens-named motels in town, obviously a local chain at one time, but the owner of our property was an old couple living in the room behind the office—they were not Stephens. Mrs. Stephens was this guy's Hughie. I called a cab and to my relief he left—but he returned a couple of weeks later, this time in a car with a "dame," as old as he and as drunk. When he asked for a room and I gave him the rate, he pulled out a wad of twenties and slammed them on the counter with a smirk. He needed the woman to fill out the registration card, but with her equally impaired legibility, I took over the task. Another hour of my life seemed to pass as every line of data seemed to inspire another tale of his glorious past and Mrs. Stephens. I can't really say it was wasted time because, well, I was a night clerk. What else was I going to do? The three TV networks and two local UHF stations went off the air by 1 a.m., and my mental capacity was too thin to study effectively during the 2–5 a.m. period, a timeframe spent watching the occasional car pass on Business Loop 70 and the garbage truck sumo wrestling with dumpsters at neighboring businesses. My office was an island of light suspended in a night of nothing happening. What occurred next remains one of the great mysteries of my life: Erie and his dame went out to the car and got in, she behind the wheel. She jerked the car backward away from the office and sped off. I called the police to alert them of an incredibly drunk driver heading west on Business Loop 70. O'Neill's Erie ends one of his soliloquys with "Ain't it the truth, Charlie?" It's rhetorical, of course, but suddenly being asked a direct question shakes Charlie from his mental vacancy. "Truth?" he stammers. "I'm afraid I didn't get—What's the truth?" "Nothing, Pal," replies Erie resignedly. "Not a thing." This seemingly indifferent exchange is the thematic centerpiece of this play. Hughie is about truth, an abstract concept that exists on multiple undulating planes. Watching Schiff's performance we can't help thinking that Erie at least engages in heightened self-promotion, but the line between fact and fiction with this guy is as blurry as the length and breadth of the play. We can easily dismiss his accounts of winning big at New Orleans race tracks and lighting a cigar with a C-note to impress dames; we take at face value that he grew up in Erie, Pa., (hence his nickname) and fled to avoid a shotgun wedding; we are less certain about his relationship with Hughie. Did Erie really teach "the dope" how to throw dice, and was Hughie so gullible he could be cheated every time? Did Hughie really try to bet with Erie, who turned him down so the night clerk wouldn't get involved in the racket? Did Erie really visit Hughie in the hospital, attend his funeral, and send a horseshoe flower arrangement? Did Hughie even exist? We know the man with that name did, for Charlie acknowledges him as his predecessor in the job—but what about the character of Hughie in Erie's stories? Hughie may have been Erie's only real friend, put perhaps Hughie is a personification of Erie's conscience, too. As Schiff plays him, Erie saunters in a joint-jangling way through his bravado recollections of his gambling career, and Neil Patel's huge set of a hotel lobby already old in 1928—with its black and white faux marble panels, dreary chandeliers, light bulbs with dancing filaments, and ubiquitous paintings coated from the lingering effects of cigarette and cigar smoke—allows Schiff room to wander with nervous energy. But he softens and stills when he talks of his interactions with Hughie. The death of Hughie is more than the loss of a friend for Erie—it's the end of his lucky streak. Since Hughie's death, Erie has not had a good break and his debts are at physically dangerous levels, all leading to his five-day bender from which he is now emerging. In a postshow talkback with the actors, the question of veracity in Erie's stories came up, and Schiff pointed out that we all lie; even the most pathologically honest among us will embellish our experiences when presenting them to others, or our memories will blur what really happened with what we wished had happened. Another aspect of truth emerges in the role of the two night clerks, Charlie and Hughie. So much of what goes on inside Charlie's head is in the stage directions. The play is essentially a one-man show for the actor playing Erie (Schiff joins an illustrious line of actors who have played the part, from Burgess Meredith and Jason Robards to Al Pacino and Brian Dennehy). The nearly lifeless night clerk only makes occasional interjections until the end of the play when he begins to genuinely interact with Erie, emerging as a potentially new Hughie. By play's end, one of Erie's tales about Hughie is playing out on stage. To get us inside Charlie's head, director Doug Hughes presents portions of the stage directions as voice-over narration performed by Reg Rogers. This is a controversial move, to be sure, one decried by some who have seen the play before, but a device other novice members of the audience, including me, appreciated. I came at it as a fan of George Bernard Shaw, who puts biographical and geographical details in his stage directions that cannot be replicated by the most talented actor or scene designer—I wouldn't mind hearing voice-over narration in, say, Arms and the Man. Director Hughes also projects vague images of memories on some of the lobby's panels and painting, a device that was more distracting than discerning. Newsome, in the talkback, said he appreciated the stage direction narration. He said it was liberating, allowing him to play physically to the mental images being related to the audience. His performance of those thoughts and Charlie's vacuous existence certainly is spot-on. "There is nothing to do," says the stage direction narration that opens the play. "He is not thinking. He is not sleepy. He simply droops and stares acquiescently at nothing. It would be discouraging to glance at the clock. He knows there are several hours to go before his shift is over." I recognized the look Newsome portrays; I've seen it floating as a dim reflection in the window panes through which I watched nothing going on along Business Loop 70 so many nights. I told the motel owners of my encounters with my "Erie." After the second one, when I returned for my next shift, they told me the guy had come in the morning after I thought I saw him speed off with his dame. He had spent the night in the room I'd sold him and came in to wait for a cab the owners had called for him. Sober, he told clearer stories: verifiable details of his lifetime friendship with Mrs. Stephens, the original owner of the chain of motels which she had sold long before. She was still alive, and my bosses had met her. He also revealed his profession: a bricklayer. He had, indeed, built the Stephens Holiday Motel. The truth is always there, somewhere.